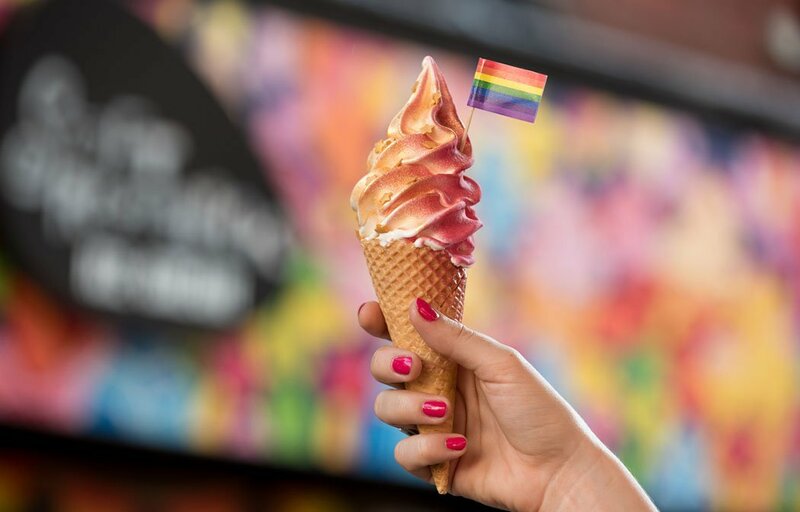 Soft Republick, the recently-launched soft serve store set to make ice cream an imaginative work of art, has created a limited edition serve – ‘Lick Me Baby One More Time’ – in celebration of Brighton Pride 2018 and Britney Spears’ headline performance on Sat 4 Aug.
Britney fans dressed as the pop idol will be offered the colourful serve for free if they visit the store at 13 Duke Street or the Soft Republick van at Churchill Square on Sat 4 Aug, posting a picture of themselves using #SoftRepubick. The one-off item has been created to reflect Britney’s signature, glitzy on-stage look. Visitors will be able to add their artistic ‘Britney touch’ to the blank canvas ice cream via a choice of gold and pink edible sparkles, gold stars and a naturally-coloured pink Choc Spray, applied by the team using a spray gun. For the final creative touch, an assortment of Britney-inspired toppings and treats will be available to add to the ice cream to create a truly visual feast. The ‘Britney serve’ will feature on Soft Republick’s menu from Weds 1 – Sun 5 Aug. Adding to the Pride festivities, prominent Aussie Drag Queen, Shae G’Day will be performing Britney’s greatest hits in the Soft Republick store between 2pm and 9pm on the Saturday. Ice cream lovers will also have the opportunity to join in the celebrations and sing for their supper, with their karaoke efforts being rewarded with a free Britney cone. Soft Republick champions a ‘no two swirls are alike’ approach to life, ensuring artistry and creative flair are always centre stage and every creation is unique. The store’s dedication to creativity is seen by its ongoing support of local artists, including its first creative collaboration much-loved Brighton artist, Pinky, whose colourful creations feature across the walls of the store. Pinky’s psychedelic designs also emblazon the exterior of the store’s two ice cream vans at Churchill Square and Brighton Station. The recent addition of fellow Brighton artist, Lois O’Hara’s, work to Soft Republick’s third floor – which is available for event and creative workshop hire – adds to the evolving and eclectic gallery feel of the store. Her bold colour combinations and eye-catching designs look at home on the art-centric eatery’s walls. Soft Republick is at 13 Duke Street, Brighton BN1 1AH, or you can pop by one of the Soft Republick trucks at Churchill Square and outside Brighton Station.